UCI Health provides specialized treatment for patients with vitiligo and other disorders affecting the skin's pigment. Vitiligo (vit-ill-EYE-go) is a disorder that causes patches of skin to lose their normal pigment. This condition can appear anywhere there are pigmented cells on the body, including hair and tissues inside the nose, mouth and eyes. It is not contagious nor is it life-threatening. However, unpigmented skin is very sensitive to sunburn and patients also experience increased itching in affected areas. A greater concern is that many vitiligo patients suffer from depression over their appearance and the social stigma they experience. This is a significant health problem that needs to be treated. We also treat hyperpigmentation disorders, which occurs when the skin produces too much pigment in response to a stimulus. These conditions can include melasma, lentigines and post-inflammatory hyperpigmentation. Our vitiligo and hyperpigmentation disorders service is led by Dr. Anand Ganesan, a board-certified dermatologist who specializes in skin pigment disorders. To make an appointment at the Dermatology Center in Irvine, call 949-824-0606. The cause of vitiligo isn’t known, but there may be a genetic component to the disorder. We know that patients with vitiligo have more sensitive pigment cells (melanocytes). Damage to these cells — from trauma, sunburn or other causes — can trigger an autoimmune reaction that destroys the melanocytes and turns the skin white. Topical and oral therapies to prevent progression — The first step in treating vitiligo is to prevent the condition from getting worse. To do this we use a combination of topical and oral therapies for the affected areas, including B complex vitamins and antioxidants. While these therapies provide only minimal improvement in established vitiligo areas, they may prevent further spread of the disease. Light therapy for vitiligo — We use both narrow band ultraviolet A and B treatments, as well as home light therapy modalities to treat the disease. The approach for treating vitiligo is different from those used to treat psoriasis or other skin disorders, and treatment protocols must be tailored to each patient to achieve optimal results. Our light therapy nurses have many years of experience in treating the disease, and there is always a physician on hand to assist with questions as they arise during the course of light therapy. We monitor each patient throughout the course of treatment using a team approach that involves nurses and physicians. Laser therapy — We use an excimer laser to treat vitiligo at higher doses. All light therapy works by activating melanocyte stem cells, which are localized around the hair follicles, and stimulating these cells to migrate out of the hair and into the skin. Excimer laser therapy works better for some patients than standard light box therapy because the treatment can be targeted to a specific area and at higher doses. This method, which we have developed and used for many years, is also tailored to the needs of each patient. Skin grafting — We may perform skin grafts on specific areas that show resistance to other therapies. This involves taking small pieces of normally pigmented skin and placing them in areas with vitiligo. Each grafted area is then treated with light therapy to stimulate melanocyte stem cells to migrate into the surrounding unpigmented skin. These grafts are very tiny (one millimeter in size) so there is minimal scarring noticeable after the procedure. Unfortunately, many dermatologists don’t appreciate the complexity of hyperpigmentation disorders, and often classify every disease as melasma, which causes dark patches to appear on the face. At the UCI Health, we make every effort to assess each patient's condition. 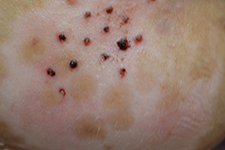 This involves careful examination and analysis to determine the location of melanocytes in the affected skin areas, and additional studies to find a possible cause. 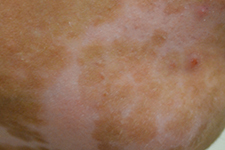 Treatment of hyperpigmentation disorders is complex and depends on correctly diagnosing the cause. Treatments may involve skin lightening agents and, depending on the cause, possibly immunosuppressive medications. Laser therapy may also be indicated. We develop a specific treatment plan for each patient, and that may involve multiple therapies.